Featured image: Students in Marrakech, Morocco, planning change for their university community (photo by the High Atlas Foundation, 2018). As a society, we have hopes and dreams for the future; for our children, our countries, and the global community. These aspirations rest on the shoulders of the youngest generation. August 12, 2018 marks the 18th celebration of the U.N.’s annual International Youth Day. This awareness day is an unique opportunity to reflect on youth’s challenges and to celebrate and support the world’s future leaders. This year’s theme, “Safe Spaces for Youth,” marks the importance of youth’s engagement, participation, and freedom of thought. Moroccan youth serve as an interesting case study to consider for this year’s Youth Day. The difficulties they confront are fairly representative of those that youth encounter globally. The U.N. 2016 World Youth Report outlines several issues that affect youth, such as high unemployment rates: youth are three times more likely than older adults to be unemployed. The Middle East and North Africa (MENA) is particularly impacted by youth unemployment, rising from 29.7 to 30.5 (2012 to 2014) in North Africa. Morocco falls slightly below this average at 19.9 percent unemployment for people aged 15-24, affecting men slightly more than women. However, the youth unemployment rate still lies far above the national average (9.3 percent). Like many countries in the MENA region, nearly half the population is under the age of 30. Problems that affect youth should be of the highest priority, otherwise countries risk suffering economically and developmentally. Unfortunately, on a worldwide level, economic barriers are often coupled with high political disillusionment and low traditional political participation. Voter turnout is low among young people worldwide; lowest in Africa and the United States. In Morocco, in the recent 2016 parliament election, voter turnout was 43 percent, remarkably low among urban and educated youth. Much of the pessimism youth experience stems from feeling that governments do not represent them and voting would not resolve this dilemma. One Moroccan youth said he had cast a blank vote considering it a message to the government. Another girl, still in high school, said she will not vote when she is older because she feels voting is not worthwhile. When talking with two young Moroccan students, they cited pressing issues for youth as the difficulty to find jobs and the inability to freely express themselves, loosely confirming the National Democratic Institute’s findings in Youth Perceptions in Morocco: Political Parties and Reforms which reported youth’s priorities in Morocco as reforming the education system, addressing unemployment, and curbing corruption. Both girls interviewed expressed frustration with the education system identifying it as the single most urgent concern, explaining that schools do not prepare them well for the job market. Issues that affect youth are deeply interconnected; an education system that poorly prepares for the job market precipitates high youth unemployment. A lack of visible change and economic irritation motivates political pessimism. The challenges youth deal with compound upon themselves. Despite these frustrations, and low traditional political participation, youth are still highly active in their communities. The U.N. report emphasizes that instead of declining, youth participation and civic engagement are evolving. An excellent example of this in Morocco is the recent boycotts on Sidi Ali water, Centrale Danone dairy, and Afriquia gas, which gained a lot of popularity through social media sites like Facebook. One high school girl interviewed said she felt most comfortable expressing herself on Facebook, but her parents objected to her publicly sharing political views and made her take her account down. Both girls said they were disappointed by the mainstream media underplaying their concerns. These observations underscore the need for youth “Safe Spaces” where youth are welcomed to share their thoughts on needs and hopes for the future. Safe Spaces include community dialogues, local meetings, workshops, and any forum for expanding viewpoints and encouraging vocalization. These settings both stimulate civic engagement and provide feedback to authorities. 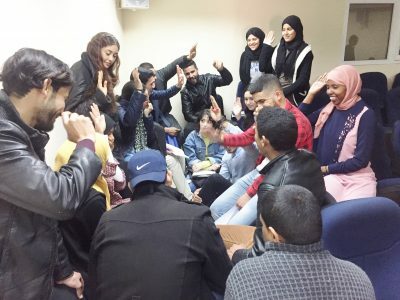 For Morocco, some of these opportunities have arisen from recent reforms attempting to resolve the same issues youth identified. One such initiative is devolution, increasing regional and local authority, affording more chances for community and youth engagement. These kinds of improvements, along with methods such as participatory development–the identification and implementation of projects that directly address community identified needs–enable youth to be empowered. Youth benefit from remaining involved, active, and vocal in their communities, and in turn, governance systems can better support youth. Local “Safe Space” meetings are just one example of where youth can impact change in their communities. Other instances in Morocco include women’s empowerment workshops, such as the High Atlas Foundation’s Imagine Workshop, which educates women on their rights, and supports them in expressing and achieving their goals. This proposed program also involves young women from universities; they not only participate in the workshop but also are then qualified to lead it.